Ever since the division of St. Martin in 1648 between the French and Dutch there was some form of cooperation between the Roman Catholic church on both sides of the island. The French first lived on the Northern part of the island with Quartier d’Orleans as their headquarters and there was also a small Roman Catholic Church there. Later Knight Durat, the Governor under Louis XVI, made Marigot the capital. Priests from the French part of St. Kitts would visit the island from time to time. At that time the islands were all sparsely populated and the islanders drifted from one island to the next so there was no need for a priest and a church. In the time of Governor de Poincy who died in 1660 St. Martin only had 150 French citizens. Pere Labat who himself visited St. Martin in 1705, wrote about the priests who were involved in religious activities on St. Martin. It was pretty rough back then. Pere Labat had a friend who was a priest in Quartier d’Orleans. It was a small man who was a friend of a free Carib Indian named Louis. They had an argument which Louis solved by decapitating the priest. On July 3rd 1768 St. Martin was declared a parish thanks to Abby Guary and Mr. Descoudrelles (Knight Durat) then Governor of St. Martin and St. Barth’s. Mr. Grisele, Royal Notary on Guadeloupe confirmed this in a deed signed by the Governor and by Alexis Bernier sexton for Quartier d’Orleans, Jean Rigualt, sexton of Marigot and Colombier, and J.P. Lafarque, sexton of Grand Case. These sextons’s did much of the church work when there were no priests available. The French revolution changed much in the islands. On St. Martin there was a slave rebellion and the church and many estate houses were burned down and the revolution brought with it a change in the relationship between the French state and the Roman Catholic Church. The priest at the time of the slave rebellion was Father Constant and he and the elite of the island were forced to build a raft and flee to Anguilla. 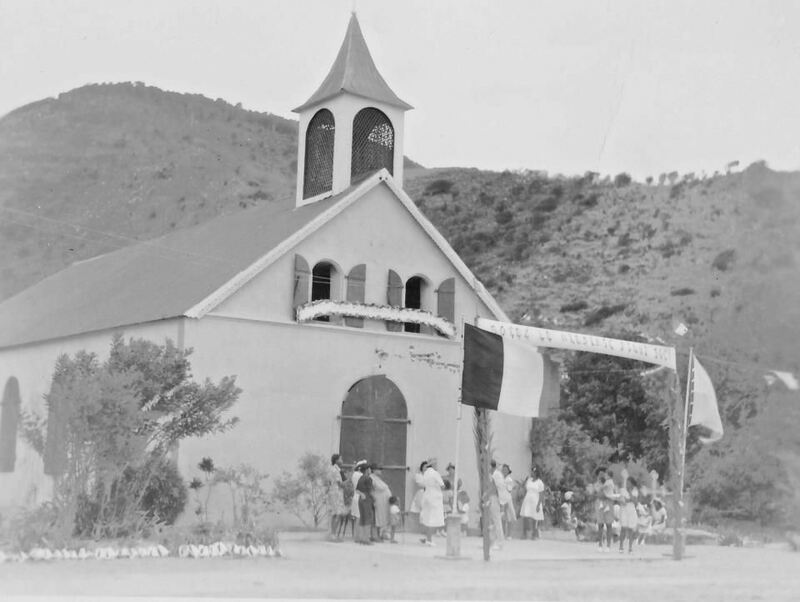 For a long time after that with the exception of a priest now and then from St. Barth’s the French side was without a priest and the Methodists from the Dutch side and the Anglicans from Anguilla were quite active among the population getting recruits for their churches. At the end of 1839 a priest Abby Fonatine was sent from Guadeloupe and on September 16th, 1840 an Irish priest Abby Wall was appointed and served until 1848. He was the one who built the church in Marigot which was dedicated on May 15th, 1842 by Mgr. Lacombe the Apostolic Vicar on Guadeloupe. Father Wall also built a chapel in Grand Case which he himself dedicated on June 12th, 1847. At the time there were 828 Catholics on the French side (316 free and 512 slaves).The Dominican priests and nuns from the Dutch side were informally active on French St. Martin since 1887. After the French revolution the French government would put a number of restrictions on the church even not allowing seminaries to train priests. And so it was that in July 1912 Abby J. Esquie with the title of deacon, the last French priest left French St. Martin and by extension St. Bartholomew as well. Already in May 1911 when Bishop Vulysteke from Curacao visited St. Maarten Father H. Smit informed him of Guadeloupe’s wish for the Dutch Dominican priests to take over the parishes of St. Martin and St. Barth’s. Guadeloupe would remain responsible and Curacao would appoint the priests. Father Smith who had already been responsible for the French side since 1910 which was a heavy burden for him as transportation back then was only by horseback or carriage then moved to the French side and became priest over there. After six years he was replaced by father S. Hageman’s who had to flee after just a half year. There was a gendarme who was living with two sisters one of which was Methodist the other one a Roman Catholic. Father Hageman’s decided to work on the sinful Catholic and told her it was not nice for two sisters to be living with the gendarme. Madame promptly went home and told her lover what the priest had told her. Now coincidentally Father Hageman’s was interested in military affairs. He had visited a French man of war and had asked a number of questions about the operational aspects of the ship. Also he like reading the Dutch paper “De Nieuwe Eeuw” which the gendarme took for a German newspaper. So he concluded that the priest must be a spy for the Germans and a move was made to have him arrested and deported. The gendarme warned the Bishop in Guadeloupe who in turn advised Father Hageman’s to leave the French side as soon as possible. The population under the leadership of Mr. B. Moreilhon wrote a protest letter to the Bishop to no avail. They praised father Hageman’s for the amount of work he had done in the short time he was there including being busy with restoring the chapel in Grand Case which was in a ruinous state. The entire population including the Protestants was ready to be witness to the fact that the priest was not a spy and was doing good work under the population. However even though 629 persons including non-Catholics signed the petition, the Bishop concluded that the motives for deporting Father Hageman’s were outside of his jurisdiction. The priest however had disturbed the gendarme’s amicable family nest and could not return. I know of many cases where a gentleman was married to one sister and had children by another sister as well so the gendarme was only following a long established local tradition. Father P. Willibrord de Barbanson O. P. wrote a very interesting little history of the forty years in which the Dominicans served these two French parishes. The history of this period is also the history of the French parishes as de Barbanson covered many aspects of the daily life of the people and how hard it was for them between 1910 and 1950 as that period covered two world wars, scarcity of food and all kinds of diseases which plagued our people formerly. One of these Dominican priests Father Irenaeus de Bruyn even managed to become a national hero of St. Barths but he deserves a separate story of his own sometime. The next priest was Father van Teeffelen who was a real go getter and who asked permission from the Bishop to collect money in and outside French territory for the completion of a new church in Grand Case. He was assisted by Miss Leonie Amande Richardson a dedicated woman of the church. By contacting family and friends in Holland and other countries he was able to collect 26.000 francs but it was not enough. 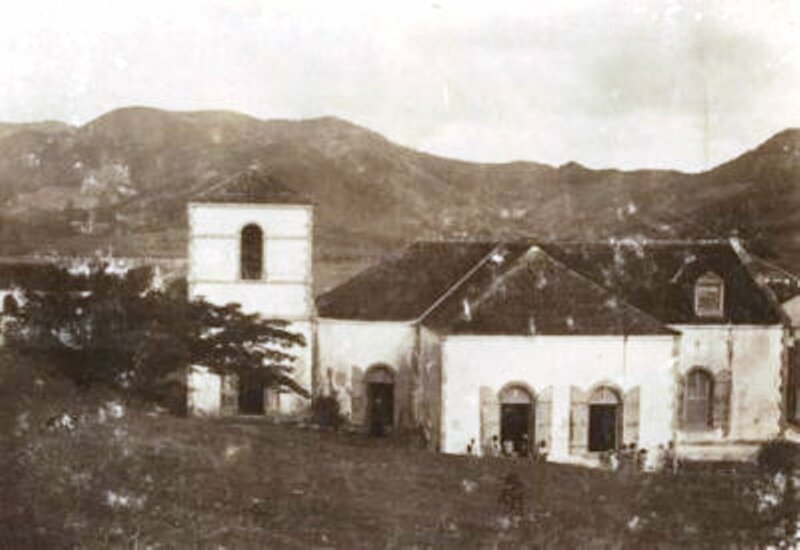 So he contacted Senator Henri Berenger of Guadeloupe who visited St. Martin on the steamer the “Marie Galante” in 1921 for help as the population was very poor at the time and a special collection only brought up 7 francs and 45 centimes toward the f. 10.000.—needed to complete the church. There is no record of any results from the good Senator but on December 17th, 1922 there was a grand opening of the church in Grand Case across the street from the old chapel. This had another story to it as when the priest decided to convert the chapel into a residence for the priest the then Mayor Ferdinand Morales decided that French law was such that church properties legally belonged to the State and since there was a church already on the other side of the street that he wanted the property where the old chapel had been. The property reverted to the commune but in turn it was made available to the priest to live on. As of 1951 the small residence of the priest with just two rooms was still there. A big blow to the church work was the departure on March 9th, 1926 of the nuns (The Sisters of St. Paul) who had worked on St. Martin for 125 years. They, but also the priest, lived very frugally in run down houses and could not expect much help from their impoverished congregation. However the priest did admit that on his birthday the poorest of the poor would bring a bottle of wine and some cakes and other goodies to his home. Although there was a call from French Quarter to build a chapel there, Father van Teefelen only got as far as buying a property on which a future church would be built. He, by the way, was also an expert on fixing clocks and watches for his parishioners wherever he was stationed and that made him popular with the people on the French side. In 1935 Father van Teefelen left and was replaced by Father Holterman (a future bishop of the Netherlands Antilles. During his term he did much to have the churches upgraded and also had some electric lights on certain occasions in the churches powered by an old generator. The Second World War it was Father Boradori who took over. He died on the altar years later on Saba while giving mass in the Windwardside church and is buried on Saba. During that time more than 200 young men from St. Martin were mobilized to go fight in Europe. It was a sad day for the population seeing their sons and brothers leaving while the church bells were ringing nonstop. The mobilization did not last long. France was quickly defeated by Germany and Marshall Petain took over occupied France under which Guadeloupe fell so the young men did not have to go any further than Guadeloupe after all. There was much hardship during the war as the French side was blockaded along with the other French islands when they were under Petain. The shared relationship with the Dutch side came in good as the Dutch side was not under blockade and those who had some money could buy goods over there. But then Guadeloupe switched sides with General De Gaulle and the blockade was eased. 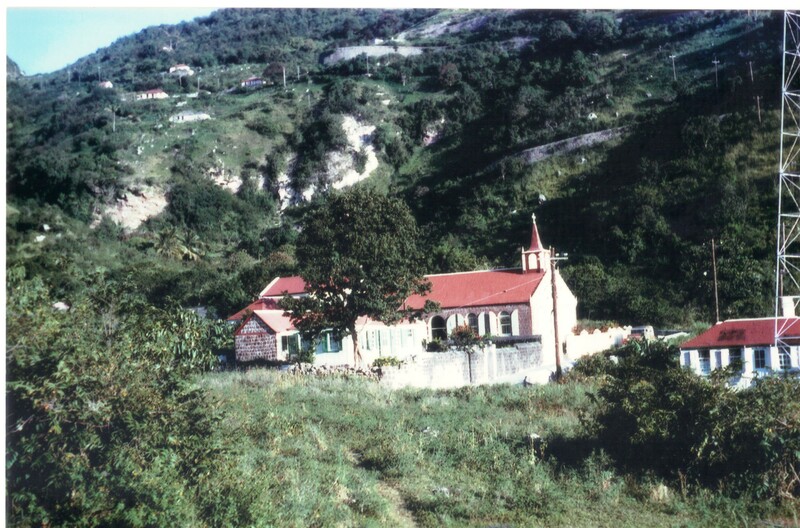 After the war a contractor A. Juste settled on St. Martin and father Boradori used his presence on the island to do repairs and expansion of the church in Marigot. There is a long story concerning the rectory location and so on, and finally Mayor L.C. Fleming even though gravely ill at the time in December 1948 gave permission for the building to start. Father van Kasteren was then priest and after the untimely demise of Mayor Fleming there was a controversial and disputed election but in the end it was Elie Fleming a brother of the deceased popular Mayor L.C. Fleming who was elected. Father Brenneker who left in January 1951 had been able together with the contractor Deldevert to convince the Mayor to allow the rectory to be built above the church and it was agreed but no building had been started as of January 1951. After the war there was a big event when the Statue of Mary of Boulonge sur Mer, was brought to St. Martin and many parades and church services were held.Even persons from other religions took part in the grand parades in which the heavy statue was logged over hill and dale by strong men from the island. 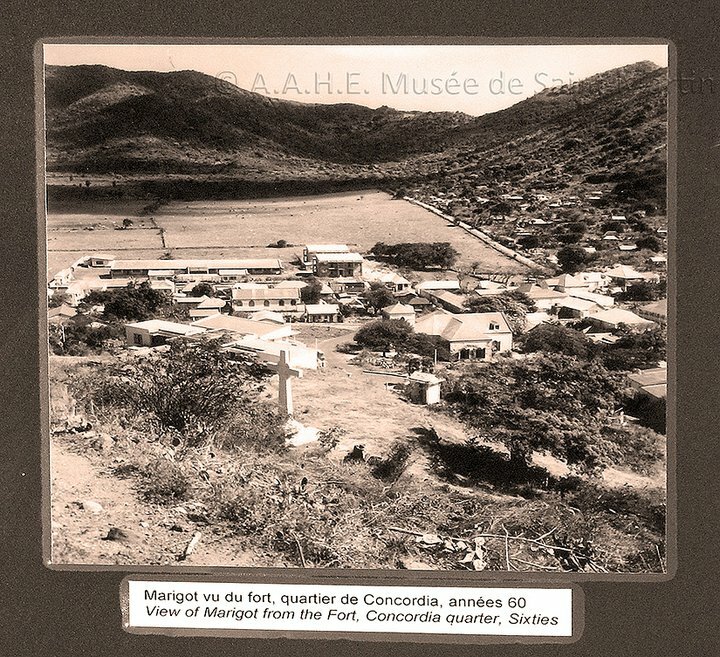 Old photo of the town of Marigot showing the R.C. Church in former times. The last Dutch Dominican priest to serve the French side was Father Brenneker who witnessed the hurricane of September 1st, 1950. This hurricane lasted some eighteen hours from midnight to six pm. There were two deaths and several people were wounded. The worst was that one of the two people who died was a child. The mother had left her house for a more secure location. The child was snatched from her arms and smashed to the ground. The sad thing is that the house she left behind remained standing while the one she was going to was destroyed. There were some 140 houses completely destroyed. The sea came up into the streets and the hillsides were scorched from the wind driven sea water. For a small population at the time this was a real disaster. The galvanized roofing of the church was destroyed and which since it had needed replacing anyway this was a good opportunity to do so. 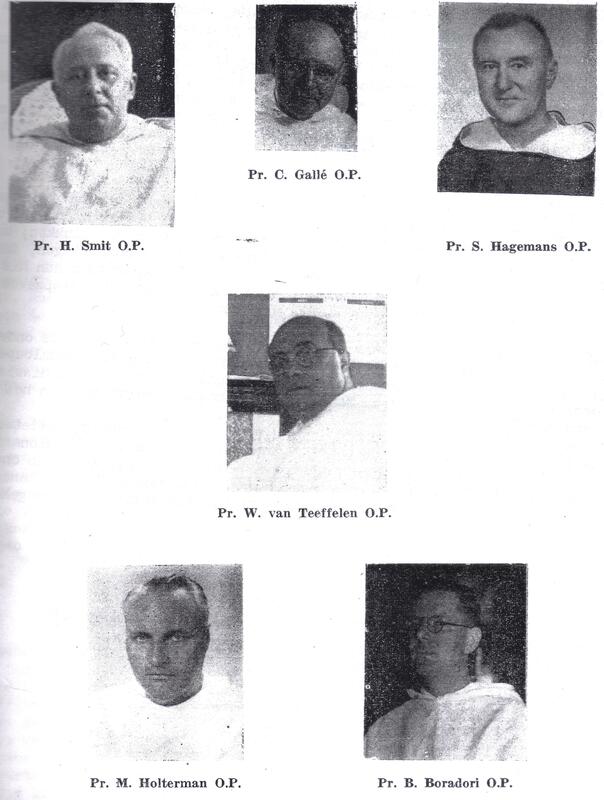 On January 15th, 1951 after consultations with the church authorities the Dutch Dominican priests were withdrawn and went back either to Curacao or to one of the other Dutch islands. And so an exceptional period in the history of the Roman Catholic Church on the French side and St. Barth’s had come to an end. During the forty years the Church had constant problems with the Masonic Lodge on Guadeloupe so much so that they accused the popular Father De Bruyn on St. Barth’s of fomenting a revolution and organizing his own army. Also encroachment by other religious denominations like the Methodists , the Adventists and even a Jehovah witness group came down on an expensive yacht to take their share of the human flotsam drifting around without any kind of religion or who had strayed away from the church. Many of the old timers remembered fondly the various priests who served their community when no French priests were available. And so it is. And after all this religious history I feel like I need a drink. Christ Church built in 1777. It is always interesting to read letters concerning Saba from so far back in time. David Hope served as the Anglican Priest on Saba from 1878 – 1883 and again from l887 – 1892. The following letter from 1892 after he left Saba and addressed to his friend Peter Every was kept by Miss Florrie Every daughter of Mrs. Helena Peterson-Every, a copy of which was given to me by the late Mr. Frank Hassell. The letter is from Stamford Bridge, York, England and dated December 31st, 1892. I have often thought of writing you a few good words about your work in church. It is very pleasing to learn that whoever gives up their post as Reader you still hold on. This is most praiseworthy on your part. May you long be spared to continue the blessed work in God’s House which has so far honoured your name. I have never heard whether Mr. Rogers brought you a volume of sermons as advised him to do and other books for church use. I hear Thomas Holm is going to sea again with Captain Lovelock (Hassell). Well I fear Thomas will feel it hard upon him with his complaint especially if he goes into cold places. Give my respects to all the people. Give the old letter stamp to Ian Hassell it is from Egypt. I hope your family are all in good health and Dickles and Beeks and Richard are all in good health and attending their church. I am truly sorry I cannot return to you on account of my health. It is my liver Doctor says. It is the fevers I have had which have done all the mischief. I am not able to bear anything much; a little bread, tea, milk little beef, but no vegetables of any kind and the cold is very cruel with me. We are having a severe frost, roads iced over and all the water frozen over, ground white with snow. I have been out of work 3 months now doing a little work just to get bread for these little ones. I do not often go home but Mrs.Hope writes to me and tells me how they are getting on. The children feel the cold very much and often cry of pain in their fingers and toes from frost. I hope you have got the bell for Church before this. I fear it is rather small. The old Bishop was too anxious to get it and never told me until after. I collected $12.50 toward Bell from lectures I gave about Saba and from a few friends. I hope you will like it. Give respects to Toney and the Crossleys and all others. Tell them how much I long after them and am pleased to hear of their welfare. I have heard of several deaths since I left Saba and that you have had a hard hurricane season, through quarantine T.C. (tuberculosis) .There is a little cholera still at Hamburg. I hope it will not get to England again. It is a fearful disease. In today’s Daily Herald there was yet another unsigned letter to the Editor from Saba. For a newspaper like The Herald one has to wonder why they would allow unsigned letters to the Editor in the first place. You see many people from St. Maarten and St. Eustatius signing their names to their opinions. When a newspaper publishes an unsigned letter to the editor that means they agree with the contents and can be held liable. This letter in particular tries to create problems not only on Saba but also between Saba and St. Maarten. A couple of weeks ago there was a strong reaction from Statia on a letter sent in from Saba with just initials. We know we. And we know who is from Saba and who not. The letter in question from Saba then was not written by someone native to Saba and neither was the response from Statia written by a native of that island. We doubt if the unsigned letter today would have been written by a Saban unless that person is a total ignoramus and we do have a few of those too. However the truth of the matter is that Saba and St. Maarten go way back. These two islands have produced offspring like Maria Liberia Peters who became Prime Minister (father Peters from St. Maarten and mother Hassell from Saba). Also Ministers like Theo Heyliger (father Heyliger from Saba and mother Wathey from Sint Maarten). Sabans including I got jobs on St. Maarten and were received as family by the whole population. Especially when Claude Wathey was in charge. But even in recent times Mr. Xavier Blackman, was elected as Commissioner of St. Maarten. One of our Island Council Members is born on St. Maarten and is of St. Maarten/Saba descent. Furthermore a large percentage of the Saba population are born on St. Maarten though living here. I would like to hope that regardless of which status Saba will enjoy in the future that Sint Maarteners would always be welcome to work and invest here. A number of people from St. Maarten have invested here in the past and in recent times. I hope that more investors will follow. The writer of the anonymous letter is concerned about employment of Sabans. Please state names of Sabans looking for work. We know we and I would like to see names of real indigenous Sabans who are looking for work. People from all over the world are coming here and not only finding work but also investing in all kinds of businesses. Is the Herald’s anonymous correspondent from Saba suggesting that Sabans have lost their initiative to work for themselves? Something which scores of foreigners are coming here and doing. The writer even suggests that in order to get Sabans to work for the private sector perhaps the employers should reduce the number of working hours. Are you serious? I personally have been calling on the Dutch government to employ Sabans as policemen, customs officers and so on. Has anyone solicited for the job of policeman as yet for example??? For twenty five years I published the Saba Herald. And yes there were anonymous letters to the Editor and most written by me. However the Herald would term the Saba Herald as a scandal sheet. I never denied that the Saba Herald was there to defend me and my party the WIPM, even though I carried regular news articles. My paper was never subsidized and no one ever spit in my mouth and told me what to say or what not to say. The Herald thinks of itself as a sort of “Higher Order newspaper” and yet participates in making accusations against people by allowing anonymous correspondents (and only from Saba) to make all sorts of allegations against government and individuals. In my political career I have worn a crown of thorns in order to bring Saba to a higher level and to create circumstances where people could find a job on their own by investing time and money into building up various businesses and many have. And I am proud of that. Those who made it on their own or through their parents hard work accuse me of making too many “make believe jobs” in government. I stand guilty for creating government employment when there was a need for it. The last years many Sabans have left opportunities in the private sector pass them by, while expecting that the government must create jobs for them. But they are a small few and if the anonymous correspondent for the Daily Herald is really concerned please publish their names and ask each one how many hours they would like to work for employers in the private sector. Shame on you and shame on The Daily Herald for allowing people in government to be constantly subjected to this sort of harassment while they are doing a great job in keeping Saba on a steady economic course and not getting much credit for it. But there is a God and he looks down on everyone and in the end will see to it that the people will pass a fair judgment on those who are working in the interest of Saba and its people and the WIPM party has been doing that since 1971 and will continue to do so.